By default Windows 7 is set to automatically re-start if it encounters a critical error rather than display the traditional ‘Blue Screen of Death’ and whilst this is fine if you only experience a critical error occasionally, it can be a bit of a pain if its regular, and you need the diagnostic information shown on the BSOD. Click on the System and Security option. Click on the System option. In the task pane on the left hand side, select the Advanced system settings option. In the Advanced tab Look for the Startup and Recovery option near the bottom of the window and click on the Settings button. 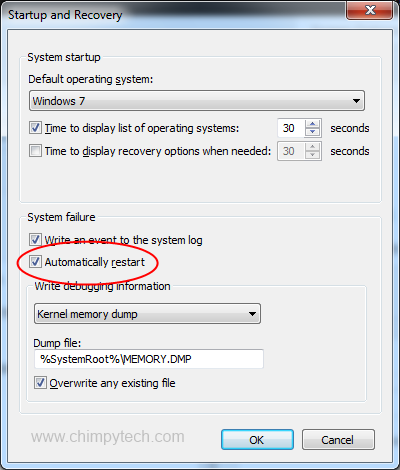 Click OK in the ‘Startup and Recovery’ window. Click OK in the ‘System Properties’ window. From now on, whenever Windows 7 encounters a critical problem it will display a BSOD with plenty of diagnostic information to help you out.